"Art of Alaska and the Pacific Northwest Coast"
I remember the first time I saw a humpback whale off the coast of Massachusetts in the Stellwagen Bank area. The power and gentle grace of that magnificent animal has never left me and those I've seen in the waters off Alaska arouse those same feelings with each sighting. The "first people" often depict the humpbacks through their traditional artwork, whether carved or painted, and in this drawing I hope to blend their totemic forms with the natural ones to envision the spirit whale. 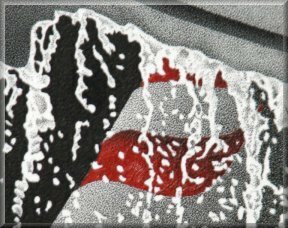 This detail gives you a closer look at the intricate stippling technique which gives the whale a soft texture, allowing it to contrast dramatically with the deep black background. It also enables you to gradually blend light to dark such as in the mist and contours of the animals. Signed and numbered giclee prints of "Tail of the Deep" are available in a limited edition of 600. If you are interested in ordering one, simply click the "Order" button below for the details. Thank you for your interest in my artwork and I would love to hear your comments on "Tail of the Deep" via e-mail.